Real human hair wigs are an expensive purchase and feel great to wear, so it pays to take care of them. But washing a wig is different from washing your own hair, and real hair wigs require more delicate care than their synthetic counterparts. What do you need to wear to make sure your wig looks its best for as long as possible? Normal hair encounters pollutants on a daily basis and, no matter how well you care for it, you can't undo all the damage they cause. This is one of the reasons why hair is replaced by the scalp. It means that, sadly, even a wig that is well cared for will not last forever. You can, however, make it last longer by taking more care to avoid problem situations. The biggest problem for hair in modern society is industrial pollutants. Try to avoid smog and avoid walking through areas heavy with petrol fumes or going into smoky factories. When you are unable to avoid this, cover your wig with a hat or scarf to keep it safe. If you are a smoker you should do the same whenever you have a cigarette, and try to avoid smoking in enclosed spaces where the smoke will linger around your head. If you wear your wig all the time then you will usually need to wash it about once a fortnight. Washing it more frequently will shorten its lifespan. Don't try to clean it in the bath or shower when you wash yourself, but wash it by hand in a basin full of lukewarm water. Use the shampoo and conditioner recommended by your wig manufacturer. If this isn't possible, use products designed for the gentle cleansing of dry hair. Keep washing short - it shouldn't take more than five minutes. Pay particular attention to cleaning the base of the wig, where it will have picked up sweat and oils from your scalp. Afterwards, gently pat it dry. It is okay to use a hairdryer on the cool setting, but letting your wig dry naturally overnight will keep it looking good for longer. 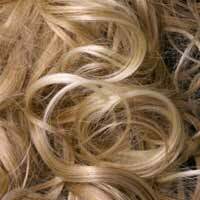 Just like hair growing from your own head, your human hair wig will be vulnerable to getting in knots and tangles. You'll need to comb it daily to keep it in good condition, but it's important to do so carefully. You can buy a special wig pick from your hairdresser, or over the internet. This will help you to work out tangles without as much risk of damage. Always grip hair near the base of the wig as you untangle it, so you're not pulling it away from the weave. If you suffer from persistent tangles, a detangling spray will make it easier for you to work them out without doing damage. There are some special detanglers available for wigs but an ordinary detangler should be almost as effective. Combing should be done when you are holding your wig in your hands, but you can brush it when it's being worn. Doing so once a day, with a soft wig brush, will draw oils from your scalp across the hairs and help to protect them as well as giving them a more natural shine. One of the great things about human hair wigs is that you can style them just as you would any other hair. This will shorten their lifestyle a bit, but not severely, as long as you are careful. You can use hot curling irons and similar tools on your human hair wig, but a better approach is to use more old-fashioned treatments that place the hair under less stress. You'll find that using rollers or rags to create curls and waves is a lot less hassle with a wig than it is with hair that's stuck to your head. Simply put them in place before bedtime and you can look forward to your reshaped wig being ready to wear in the morning. Some people find that it's difficult to style a wig when they're not wearing it because they can't see what shape it's going to take. Of course, if you do wear it at the time, you'll have the old problem of not being able to see the back of it. A good solution is to buy a model head (they're cheaper than you might think) and rest it there when styling. Keeping it on the head every night will also help to keep it in shape and make sure it stays looking great.